Joe Bourne's Brain Dump Blog! : Sawed my Thumb Nail in Half!! Sawed my Thumb Nail in Half!! Yes thats right folks, i put a saw right through my left thumbnail!! 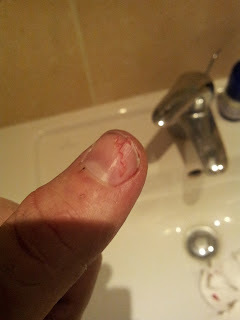 I was up in the loft, sawing some wood for my loft boarding project when the saw slipped and went right across my left thumbnail - outch!!! I made a big, comedy bandage from cotton wool and insulation tape and went back up into the loft to get more work done.